I need to say this before my fingers type any more words: I love Jesus. This love has been transformational in my heart, and hopefully, in my words and deeds. I love Jesus so much, it feels powerful and life-giving and perfect. We need to quit making such a massive effort to keep Christ in Christmas. Fellow Jesus Lovers, I have a deep affection for you. You are serving Him well in your communities, homes, and churches. Your love for Him is passionate and beautiful. He sees you and treasures each one of you like you are his only child. But he doesn’t need you to work so hard at keeping his name in Christmas. Jesus is Jesus. He is God. He is powerful, almighty, and infallible. He is, and was, and always will be. And because of this, I am convinced Jesus has this thing figured out. In fact, I’m convinced Christ will straight up refuse to be removed. 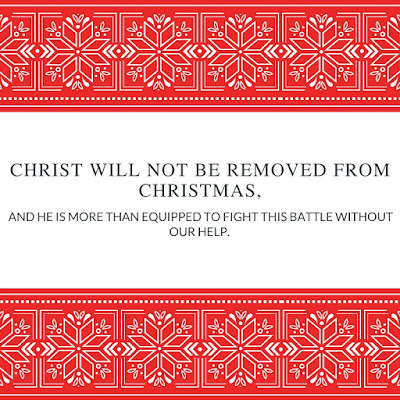 Our bumper stickers and Facebook status updates reflect this notion that people—folks God himself created—have the power to erase Jesus from Christmas. That Christ himself can be ignored on the day dedicated to his birth. For years, I’ve listened to discussions, read blogs, and seen tweets about Christmas becoming less about Christ, and culturally that may be true. But eternally, where it matters, Christmas has always been, and will always be about Christ. 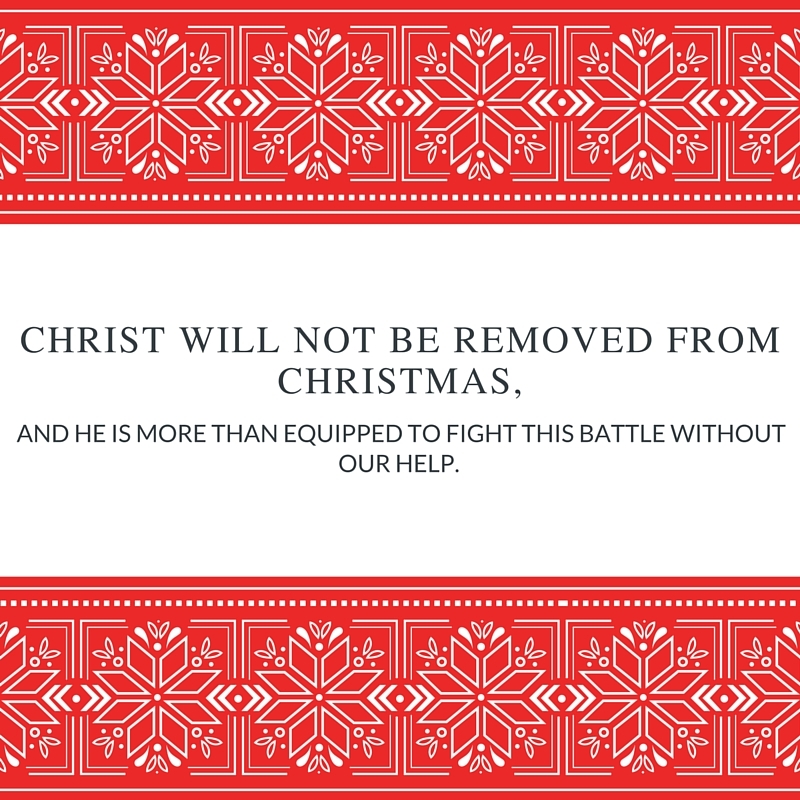 Christ will not be removed from Christmas, and he is more than equipped to fight this battle without our help. You see, no matter what anyone or anything tries to do, Christ will not allow himself to be separated from us. Christmas will always be. We don’t have to fight this battle, because he has already won. Nothing can keep us apart from him. Jesus has left me absolutely convinced that we have nothing to fear. Even if celebrating Christmas becomes outlawed, even if we aren’t allowed to mention his name, Christ will still be in Christmas. He just will. He has promised that he will never leave us or forsake us;* we needn’t be afraid. Dear Friends, I’m convinced the best way to honor Christ this Christmas, to really keep him in the holiday, is to live the gospel message this season. Love each other well. Love people outside the church lavishly. Teach your children about his abundant love. Spread the word that our Savior was born and still lives. Our Facebook friends don’t need our memes, which have become nothing more than resounding gongs and clanging cymbals. ** They need to be shown the love of Christ in meaningful ways. They need to be loved, seen, and encouraged. Maybe if they saw Jesus for who He is, our loved ones would have the desire to know Him the way we do. And I can’t think of a better way of honoring Him at Christmas than helping others understand why we celebrate. Keep Christ in Christmas this year. Honor him. Represent him well. And do so in confidence, knowing that even if we wanted to, we couldn’t remove him or make him “less.” He won’t allow it. Yes! I think we forget this all the time. He is enough. Amen and amen. Jesus will always be and God can take care of Gods-self. He doesn't need us to defend Him. Instead He needs us to take care of His children and creation.